The Small and Medium Enterprises Development Agency (SMEDAN) recently launched the Conditional Grant Scheme (CGS) for about 2000 micro enterprises in Lagos State. The scheme is expected to lift the sub-sector, making it more efficient and financially viable. In his address at the launch of the scheme held at the LTV Multipurpose Centre, Ikeja recently, The Director-General and Chief Executive of SMEDAN, Dr. Dikko Umaru Radda, said the micro enterprises sub-sector is a critical sub-sector in the Nigerian enterprise development space. He said the sector collectively account for a majority of the enterprises in Nigeria and also account for the highest number of jobs created in the economy. The findings in the National MSMEs survey of 2010 and 2013 revealed that micro enterprises represent 99.87 per cent (17,261,753) and 99.80 per cent (36,994,578) of total enterprises respectively. The special guest who is also the Deputy Governor of State Mrs Aderanti Adebule commended SMEDAN for the laudable initiative of granting loans to over 2000 MSMEs in Lagos state under its flagship programme. She enjoined beneficiaries to make good use of the grants, she also assured SMEDAN of the state’s government commitment to partner with it in the area of MSME development. In his address the Chairman SMEDAN Governing Board Otunba Femi Pedro reiterated the Agency’s commitment to develop and promote the Micro Small and Medium Enterprises sub sector of the economy. He expressed hope that the Conditional Grant Scheme CGS if properly deployed and implemented to its full potential has the capacity to create millions of jobs across the entire country. He stated that Lagos state has a large concentration of MSMEs and that the Agency will do all in its power to formalize them so as to access funds from government and compete internationally. 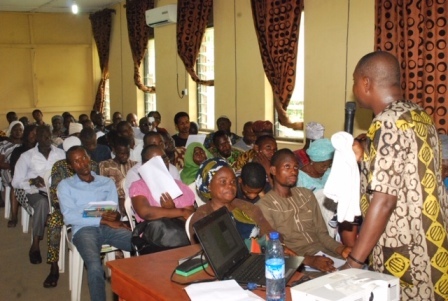 He appealed to beneficiaries of the grants to utilize it judiciously so as to enjoy more government patronage. 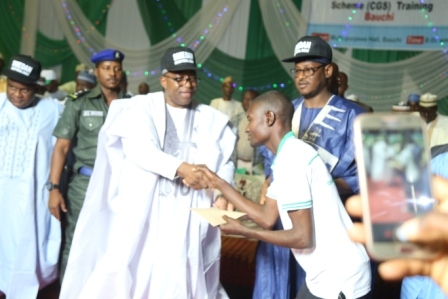 He congratulated the beneficiaries and thanked the management of SMEDAN headed by Dr. Dikko Umaru Radda for spearheading the revolution in the Agency. He said the introduction and subsequent implementation of the Conditional Grant Scheme, CGS was apt and in line with President Muhammad Buhari’s agenda to move the nation forward. Beneficiaries of the scheme cuts across all the 20 local governments of the state. 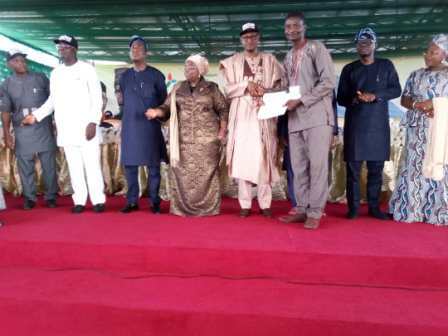 Dignitaries that spoke at the occasion includes the Lagos state APC governorship aspirant Babajide Sanwoolu and some beneficiaries of the Scheme who all poured encomiums on SMEDAN for introducing the conditional Grant Scheme.